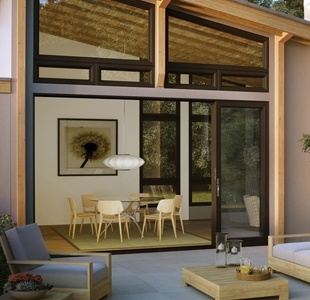 Bring the outside in and add a touch of luxury to any home. Open up to an entirely new way to look at luxury. 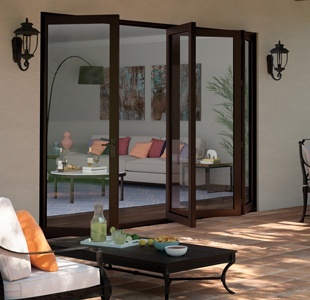 Milgard® Moving Glass Wall Systems are an innovative way to experience indoor outdoor living. Aspirational, yet realistic, these sliding walls seamlessly transition between dreams and reality. When the doors are open, the great room and patio areas become one large living area, great for entertaining or just relaxing. We love our sliding wall! We replaced three windows in our great room with a 15' Milgard® Moving Glass Wall System. It has completely changed the functionality of our home. Stacking Moving Glass Wall Systems offer sweeping outdoor views, flooding the room with natural light and fresh air. Each panel stacks on top of the first when open. Choose from four aluminum colors. With this stacking Moving Glass Wall System, you can select from two interior wood color options and four exterior aluminum frame colors. As the door opens, each panel stacks on top of the first one. Pocket Moving Glass Wall Systems make a design statement. When the patio door is open all the way, the panels are hidden from view. Each one slides into the wall pocket, for a seamless transition from indoors to outdoors. 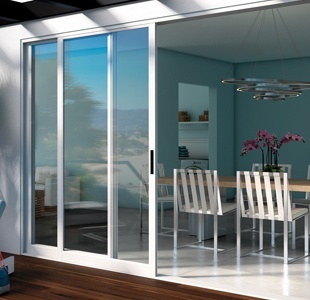 If you are looking for an option where the doors completely disappear from your view when fully open, pocket Moving Glass Wall Systems are a beautiful solution. The exterior is aluminum and available in four colors. The exterior is wood with two different options. Unfold the potential of your living space. 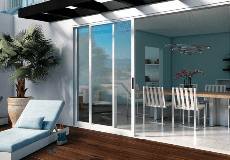 Bi-fold Moving Glass Wall Systems are a smart and effective design to integrate the outdoors with indoor living. Each panel folds on top of the adjacent panel when open, like an accordion. Aluminum frame options are in four colors. Moving Glass Wall Systems is rated 4.1 out of 5 by 7.